Shirley Kirsten, president of the year-old National Substitute Teachers Alliance (NSTA), tells Education World that although the demand for substitute teachers is increasing, the pressures on them are growing as well. Substitutes need more training and more support, Kirsten says. Included: The benefits and drawbacks of substitute teaching. Shirley Kirsten of Fresno, California, is president of the National Substitute Teachers Alliance, the first nationwide organization for substitute teachers. The group formed at the first National Substitute Teachers Conference in July 2000. Kirsten, a substitute teacher since 1997, is also a concert pianist, piano teacher, and freelance writer. Education World: Why do substitute teachers need an organization to represent them? Shirley Kirsten: Substitute teachers have never had a national voice to address their issues. Of universal concern to substitutes is the need for respect for their educational contributions. Bound up in this is the need for school districts to provide adequate professional training and development for substitutes, who are in short supply, and to encourage a positive working relationship between classroom teachers and their substitutes. Low average daily wages, lack of health insurance and other benefits, and lack of due process -- a substitute teacher does not enjoy the right to a fair hearing or a process of complaint resolution if he or she is reported for classroom infractions -- contribute to critical nationwide substitute shortages and an overall decline in substitute teacher morale. The National Substitute Teachers Alliance attempts to raise the self-esteem of substitute teachers as education professionals and to promote higher standards for entering the profession. NSTA also focuses on supporting a cooperative relationship among substitute teachers, regular classroom teachers, administrators, parents, and legislators, one that will ultimately serve the critical educational needs of our nation's students. EW: What are the biggest challenges facing substitute teachers? Being able to communicate adequately with the classroom teachers they replace. Written lesson plans, which can range from sparse to detailed and complex, may not give a reliable roadmap for a successful classroom experience. 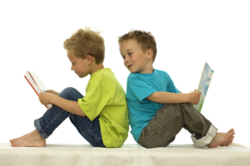 Maintaining control over classrooms with an abundance of behavior management issues. If the classroom teacher has not adequately prepared students for the appearance of a substitute teacher, the substitute is at a grave disadvantage. Substitutes also are challenged by school administrators who may not give enough back-up to subs when students are referred to the office for discipline problems. Working in special education classes, with little or no special training provided. Dealing with the rigors of long-term assignments, especially when adequate long-range lesson plans and/or adequate contact with classroom teachers are not provided. Commanding the respect of students, parents, and school administrators, so learning will not be interrupted during teacher absences. EW: How has the role of the substitute teacher changed over the years? Kirsten: An increased demand for higher student performance has increased the educational responsibilities of substitute teachers. With the national focus on standardized testing as a measure of a school's performance, every bit of time a student spends in the classroom contributes to performance and achievement. According to recent studies, between kindergarten and 12th grade, the average student will spend, cumulatively, at least one full year of classroom time with a substitute teacher. That figure is based on a 10 to 12 percent teacher absence rate -- which is due, in part, to increased teacher in-service days. Administrators, therefore, are extremely concerned with the quality of the hours students spend with substitute teachers. Given this focus, a substitute is expected to have command of the classroom on academic and behavior management levels. The importance of substitutes in the lives of students is made more poignant by class-size reductions, which have increased the number of classes at different grade levels and increased the demand for substitute teachers. Substitutes have been recruited to be classroom teachers on an emergency-credentialed basis because of teacher shortages. EW: Why is the pool of substitute teachers shrinking? Kirsten: The substitute pool is shrinking because of a lack of respect for the profession. This means a lack of local and national resources devoted to professional training and development; a lack of mentoring (especially as it pertains to long term assignments); universally low daily wages; and a lack of health insurance and other benefits. More critically, substitute shortages are a reflection of a highly competitive job market, in which candidates with college degrees are lured to full-time jobs providing health benefits, paid vacation time, increased job security, and the opportunity for promotions. EW: Why would you recommend substitute teaching to someone? Kirsten: Substitute teaching can be a rewarding profession for those who love spending time in a learning environment with opportunities for teaching students of diverse ages, backgrounds, and abilities. Moving from school to school and from classroom to classroom provides exciting teaching challenges. For most substitutes, this flexibility is welcome. More importantly, however, the ability to pick one's hours and work days is a great enticement. Recent graduates of teaching-credential programs find that "subbing" is the best route to obtaining a permanent, full-time teaching position. 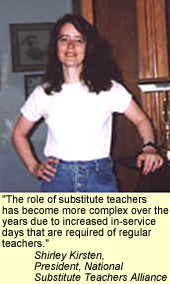 Although the pay might not be high and the fringe benefits are nonexistent, substitute teaching still provides a dynamic teaching adventure that attracts aspiring classroom teachers, retired teachers, mothers who have deferred careers to raise children, retired policemen and firemen; part-time university faculty, writers, musicians, and magicians, among others. The substitute population is creative and diverse and enriches the classroom environment. This e-interview with Shirley Kirsten is part of the Education World weekly Wire Side Chat series. Click here to see other articles in the series.